And we are so happy she’s part of our world. She was lost when we met her and living outside. We thought she was wild-with her brown bunny hide! She came hopping right over and sat at my feet. We knew that this bunny couldn’t live on her own. She reached up and said she’d be happy to stay. And realized quite quickly that she was our teacher. From tooth purrs to binkies and timothy hay. Now we bless her at night and each day when we pray. And delight in the laughter that shows her our pleasure. Or is she an angel God sent from above? And we are so blessed to be part of her world. Clover was rescued by my husband on March 16, 2008. Her prospective foster mom named her Clover. 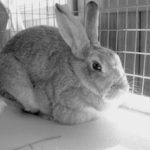 Without the help received from the Upstate New York chapter of the House Rabbit Society, we would never have known the joy of living with this beautiful girl. Thank you so much!